Hi everyone! Hope you all had a little "summer" in your neighborhood today! It was in the high 80's here, shorts, flip flops, and a pony tail were exactly what I needed to stay cool. I just love warm weather. It is days like today that I LOVE more than anything. I got to cut the lawn (nothing makes me happier than jumping on the ole John Deere and mowing the grass), we had a cook out, got to spend plenty of time with the farm animals...little things like that make life happy. Decided to share a layout tonite. It's of me and my Papaw. I'm so addicted to odd shaped paper at the moment. Sometimes I think less is more....no need to go over the top on a layout if you have a picture that you want to be the focus. 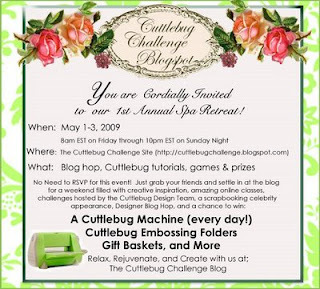 Don't forget, Friday kicks off the Cuttlebug Challenge Spa Weekend. I can't believe all the great stuff that's going to be given away!!! Believe me, you don't want to miss it! Happy Wednesday!!! 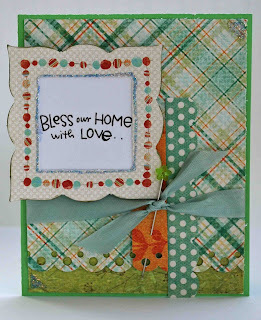 This week's Be Inspired challenge at Cuttlebug Challenge is "Home Sweet Home". This is a fun one because there are so many options...do a LO about your home sweet home, a card, or home decor. The list goes on and on. Just remember to use the Home Sweet Home theme + Cuttlebug. 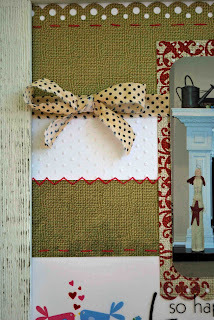 For this week's project we got to work with beautiful paper from Marks Paper Co. It was so hard to pick which pieces of the beautiful paper I wanted to use. And the winner this week will get their own paper pack from Marks Paper Co.! I decided to make a home decor/LO this week. Click on the picture for a closer look. I bought a plain wooden rustic frame at Hobby Lobby months ago. I painted it white and then sanded it to give it a vintage look. Then I used a 8 1/2 by 11 piece of white paper as my background. 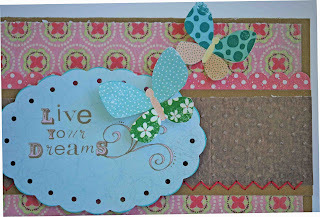 I added my Mark papers....embossing the one under my picture with Swiss Dots then sanding it with a nail file. I also did a strip of white and embossed it. I added a small bow and ribbon just to tie in the vintage look. I did all the stitching by hand, much safer than me destroying my perfectly good sewing machine! The overlay at the bottom is Bo Bunny and perfect for this type of project! I used my MS scallop punch to make the lovely scallops. This is my Easter picture from Easter Sunday after Church...I always force Hubby to take a special "dressed up" Easter picture! He wasn't crazy about the idea, but complied so that's all that matters. That's why I wanted to frame this picture, because it's a special Easter memory. Now it's your turn! Can't wait to see your beautiful creations at Cuttlebug Challenge! And don't forget about our upcoming Spa weekend May 1-3! A quick update: Dalli and "Mr. Kitty" are doing great! But now I have another sick animal, my duck! She has a swollen leg and the vet put her on antibiotics. You've not lived till you try giving a duck a pill! Lets just say, I hope no one was watching! I was splashing everywhere in the creek trying to grab the duck and the pill (that she spit out! Who knew ducks could spit!). Lets just say my cute pink WATERPROOF boots came in handy! And the best part, she has to take 2 tablets a day for 10 days! Should be interesting! I used DCWV & Melissa Frances paper, Melissa Frances rub-ons and stickers, MS ink, and hand stitched the sewing. It's Friday and I'm already done with my 2 Sketches card for the week (which is early for me!). 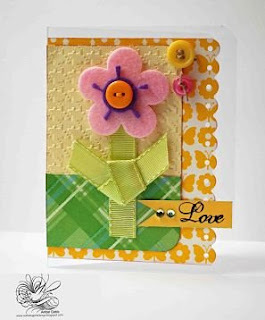 This is one of my favorite cards I've made, love the My Mind's Eye papers...Such Springy colors. 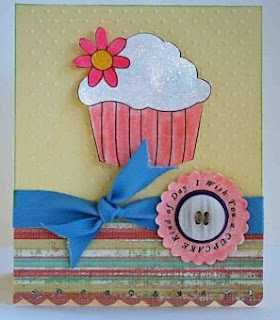 I also used Colorbok and Making Memories papers and my MS Scallop punch, Doodlebug stickers, and sewed on this card. 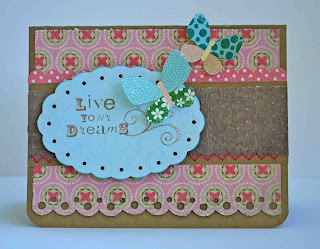 And of course I used my Cuttlebug and the Swiss Dots embossing folder. It is sunny and warm in Kentucky today. Wish everyone was having weather as beautiful as we are! 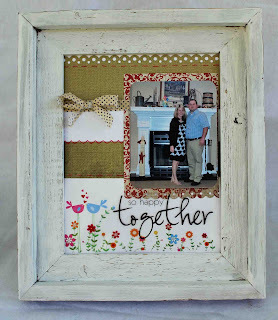 It's time for another "Be Inspired Wednesday" at Cuttlebug Challenge. This week's theme has meaning....think of today's date???? Yep, April 15th. And what goes with taxes, NUMBERS. This week's sponsor is the amazing Elle's Studio. I hope you are ready for a challenge because I never dreamed numbers could be so hard! It took all my brain power and I decided to do a layout. 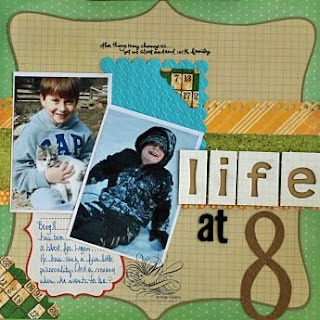 This is my first layout for the Cuttlebug Be Inspired Wednesday...so I hope you like it. 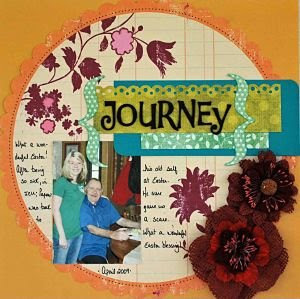 The Cuttlebug Challenge loves when its followers make cards, layouts, or altered projects. Just use the Cuttlebug + challenge of the week. This page is of my nephew Logan. He has changed so much since turning 8...growing up and developing his own little personality. So I wanted to do a special page focusing on his age. I used Colorbok, Rusty Pickle, Cosmo Cricket and My Mind's Eye paper. You can see the different embossing by the Cuttlebug all over the page in different areas - I used the Hounds tooth and Swiss Dots embossing folders. I used my Cricut to make the pretty 8. The letters are from Scenic Route and American Crafts. I used my Spellbinders Nestabilities, Sassafrass stickers, and Melissa Frances rub on. 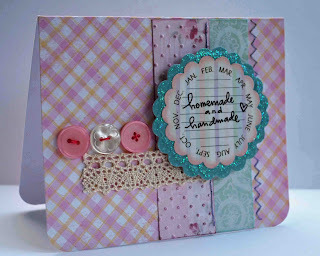 It was fun doing a layout for this week's challenge, makes me craft totally differently. And don't be afraid to use your Cuttlebug on layouts. Be sure to check out the DT's amazing creations at Cuttlebug Challenge. And I can't wait to see what you create! You'll be proud, I actually got done with my 2 Sketches challenge of the week...I've been slacking on them lately and miss it! 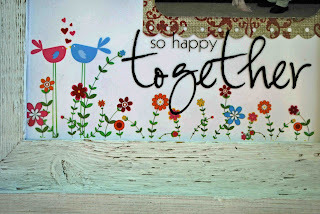 I used all My Mind's Eye Paper, Melissa Frances rub on, Martha Stewart ribbon, Stickles, and Making Memories pin. My Mind's Eye has new paper that takes me breath away! It is AMAZING! Now I want to share a few pictures with you. I've been off on vacation this week, so Hubby and I took a road trip. 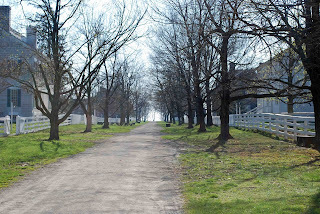 We went to visit the Shaker Village of Pleasant Hill, Kentucky. It a beautiful historic trip full of great photo opportunities. Click on the name to check out their website. I also got in some GREAT scrapbook supply shopping, yippee! Found some wonderful stuff. OK, now back to my pictures. This first one is the view when your walking thru the village. It was early in the morning and just beautiful. 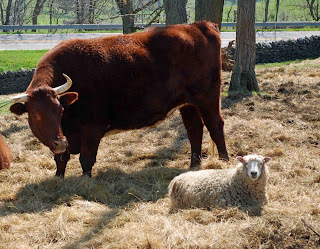 This picture is of an ox and a little sheep lying next to it. I love the look on their faces, so cute! Hope everyone has had a wonderful Easter weekend! I've got to go to sleep early tonite because in the morning is Sunrise Service at Church at 6AM. It is my favorite service of the entire year, we watch the sun rise and have a special meeting in honor of Jesus raising from the dead early Easter morning. It has so much meaning and always such a Blessing. 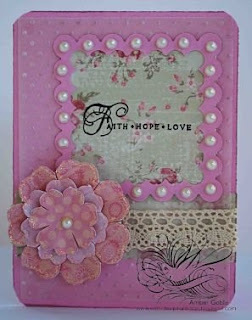 I used Colorbok and Melissa Frances paper, The Paper Studios vellum & pearls, my square Nestabilities, Swiss Dots embossing folder, Papertrey Ink stamps, K & Co. flower, Melissa Frances lace, & Stickles. I embossed my vellum with the swiss dots embossing folder and then ran a light layer of pink ink over the top to make the embossing really stand out. I put one piece of my Melissa Frances paper under the vellum and one on top to give it a foggy look. I then took my Nesties to make the little frame around the paper and sentiment...use 2 Nesties that are next to each other in size and run it thru your Cuttlebug at the same time, one in the other. It makes a cool frame. I put my embossed vellum over top of the same Melissa Frances paper I used on the card above and ran over it with my ink pad. I then tore the edges of the paper and vellum then inked those edges also. See the cute gingham fabric - my dog groomer always puts a cute bandanna around my Gracie when she gets her hair done and I recycled this one to use on a card. The rub on is Melissa Frances. Now it's your turn to make a card. Cuttlebug Challenge is giving away a gift certificate from CropStop to this week's winner! 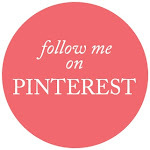 I feel like I'm neglecting my blog! So I thought I would post something random. I'm digging thru the archives to find a card I've not posted. 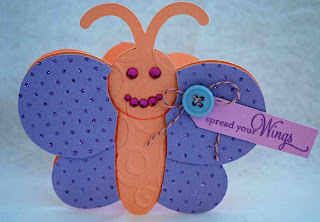 Here's a little butterfly card I made a few months ago. Didn't post it because I thought it's little smile was creepy, hehe. Here's another card I made with the great digital stamps from The Cutting Cafe. 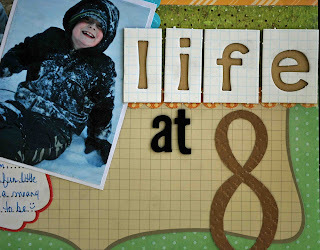 I've been working on scrapbook layouts lately...I feel like I've also been neglecting them and will never catch up! This week we have a wonderful sponsor, Alicia of Short Cuts. She has amazing products and has made it her mission to make scrapping simple! This week we got to play with sheetloads, her frosted and clear acrylic cards. I used the clear acrylic sheetload as the base of my card. 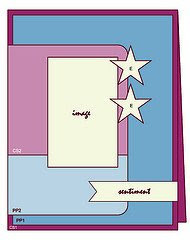 You can create your heart out, anything you can dream, with these amazing little sheets!!! You can emboss them, paint them, cut them, the options are endless. And the winner of this week's challenge will get their own sheetloads to play with! Plus the DT at Shorcuts is also doing this challenge - an intersite challenge...how fun! 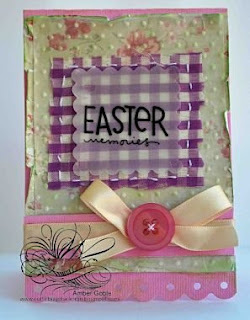 I used my Cuttlebug and new "loved" Houndstooth embossing folder. My paper is DCWV, my little flower is a Hobby Lobby special, Melissa Frances rub-on, American Crafts ribbon, and K & Co. jewels. Now go over to Cuttlebug Challenge and look at all the DT's amazing cards! Just beautiful! And more exciting news, my Mom is a new team member at Inspirational! I'm so happy for her!